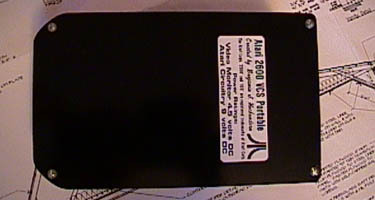 Hard to believe it’s been so long… 9 years ago this month I completed my first portable gaming project, the Atari 2600 VCSp. You can read the original story by clicking here. I found some photos of the unit that I don’t believe have been on the site before, you can check them out below. In other news, I plan to do some site changes to include an easy-to-browse gallery of all my work, more downloadable data and other things. Stay tuned! A photo describing how the battery door opens. Very informative. 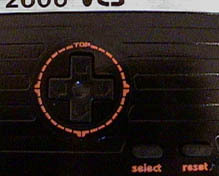 A close-up of the D-pad. It’s from a NES controller, along with the other buttons, and there’s an Atari joystick “ring” graphic around it. 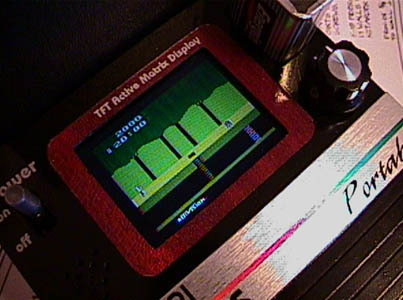 I still use the original ring graphic in new Atari projects, it has never been redrawn in 9 years. Also original is the script “Portable” font. Most of my “favorite” parts drawings were all redone in 2004 during the book writing. Power switch and screen. The woodgrain is actually real, with a gloss overcoat. Unit from rear. My screw placement wasn’t so hot back then. I think they were size 6 screws, and not even Phillips! This photo has some good detail for such a crummy image! 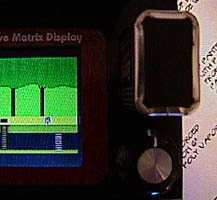 Back then, I used the still frame feature of my old Sony Digital 8 camera (used to film Lizard of Death) and dumped the 640×480 shots to computer via a serial cable. Old school serial. I still have that camera and it still works, even after being duct-taped to a jet ski, hit with a trash can lid, roped under a truck and bashed up in luggage on many trips (it gets new scratches every time it flies in checked baggage). Go Sony! 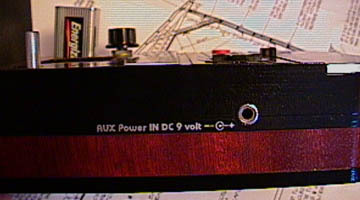 You could plug in an Atari power supply to run the Atari part only – the batteries still power the screen. Sigh. Hope you’ve all enjoyed this trip down memory lane! Wow, Has it been that long. 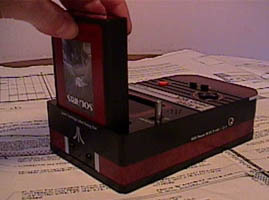 Any chance we can have a Modern Video of this classic in action? Ben… without talking numbers, are you living a more comfortable life today as you would had you stayed in the graphics design industry? I’m not trying to be sardonic, or insulting… I’m just curious. And feel entirely free to include “not having a 9-5 job” in the “more comfortable” bracket. Just curious. This is really none of my business, so if you’d rather not answer… please… don’t answer. I miss the alt text in your old articles. Awsome trip down memory lane Ben. Interesting that you post this – just today I went through all my YouTube videos of my portables and was reflecting on how far I’ve come in my understanding of electronics and case design. I want to thank you for writing your book and having the forums on this site – I’ve learned so much from them! Okay. I totally understand things have been busy in the Ben Heck world… but it’s been a month and a half.